Vertex Mobile Crane with the necessary equipment to travel at speed on public roads, and on rough terrain at the job site using all-wheel and crab steering. This crane is mounted on an undercarriage with four rubber tires that is designed for pick- and-carry operations and for off-road and "rough terrain" applications. Banking on our enriched industry experience, we are able to supply Crane Simulator. We are a top-notch organization, engaged in providing Crane Simulators. 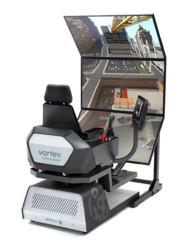 This simulator becomes an important educational tool to complement the training with a real crane. Thanks to this simulator, the students can perfectly understand how the machine works, getting to be skilled enough to use the controls in a fast and secure way, without making mistakes. From our wide consignment, we are affianced in supplying Crane Simulator. We are engaged in offering Crane Simulator. Our reputed entity is engaged in supplying Crane Simulator. We are a top-notch organization, engaged in providing Crane Simulator. Our vast experience in the production of simulators for the transport industry enables us to produce unique systems in various configurations which meet the specific needs of our customers.